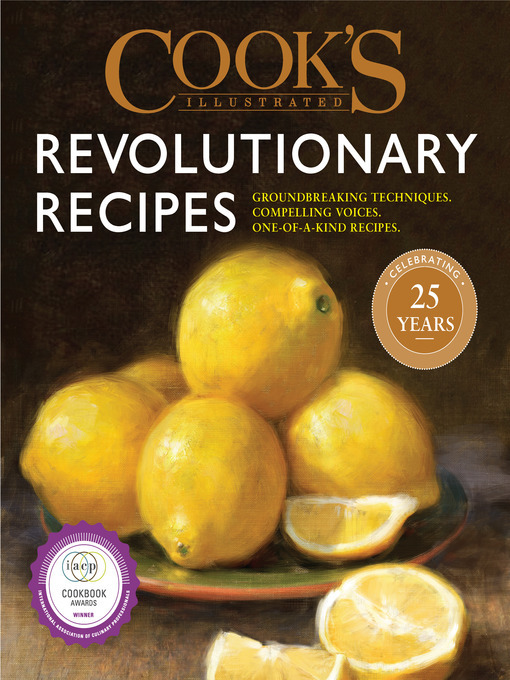 On the occasion of Cook's Illustrated's 25th anniversary, we've gathered together our most extraordinary recipes and innovations from the past quarter-century in this hands-on book packed with practical tips and techniques. These recipes tell the story of how Cook's Illustrated has changed American home cooking through its signature blend of rigorous testing, culinary research, science, and unorthodox approaches to developing foolproof recipes. As fans know, a big part of what makes the magazine so trustworthy (and enjoyable to read) is the essays that accompany each recipe, tracing from initial brainstorming to aha moments (and the occasional catastrophe) to final success. Rarely republished since they first appeared, these feature-length stories celebrate the art of food writing and the extensive work that goes into every recipe. In addition to the recipes, essays, and helpful sidebars, this book also features the trademark black-and-white illustrations that have become synonymous with Cook's Illustrated, creative use of the beloved front- and back-cover art, and a new addition: gorgeous, full-color photographs of each dish. Featured recipes include: Perfect corn on the cob that never gets boiled, ultracreamy tomato soup that's completely dairy-free, the fastest roast chicken recipe, "oven-grilled" London broil, and ingenious, low-key approaches to traditionally high-fuss recipes such as risotto, French fries, pie crust, and many more.